Though arguably the most recognizable airplane ever built, it turns out that I had not traveled on a Boeing 747 (the original "jumbo jet") in years. This combined with the storied history and legendary quality of British Airways (BA), which I had never flown, to make for a highly anticipated journey. 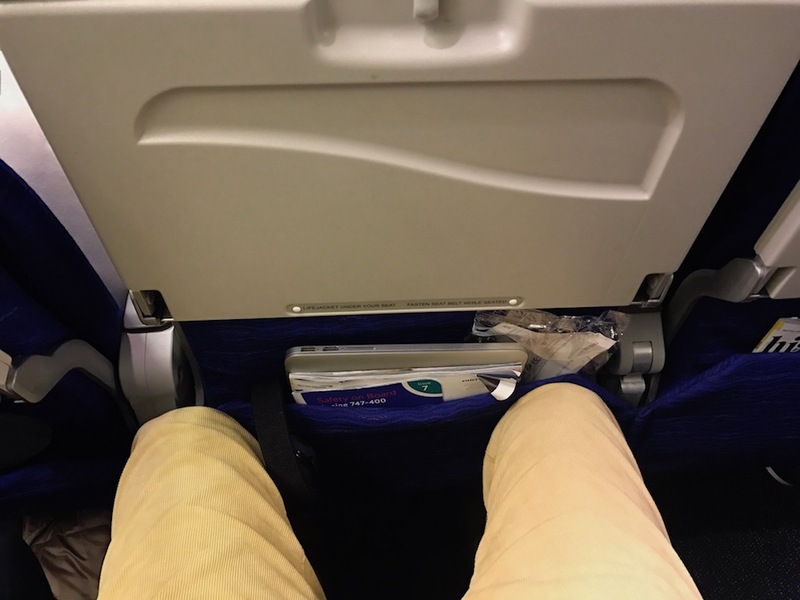 Final analysis says that it's good for travelers who can find the right price, who value reasonably decent airplane food, a comfortable physical seat, full tea service, and who can overlook a surly crew and some of the most cramped leg room I've ever experienced on an international flight. We connected from a jetBlue flight that landed at Boston's Terminal C. Happily, passengers can easily walk from Terminal C to the international Terminal E (there is no Terminal D) without leaving security, so we were unaffected by British Airways non-participation in America's TSA preCheck program. 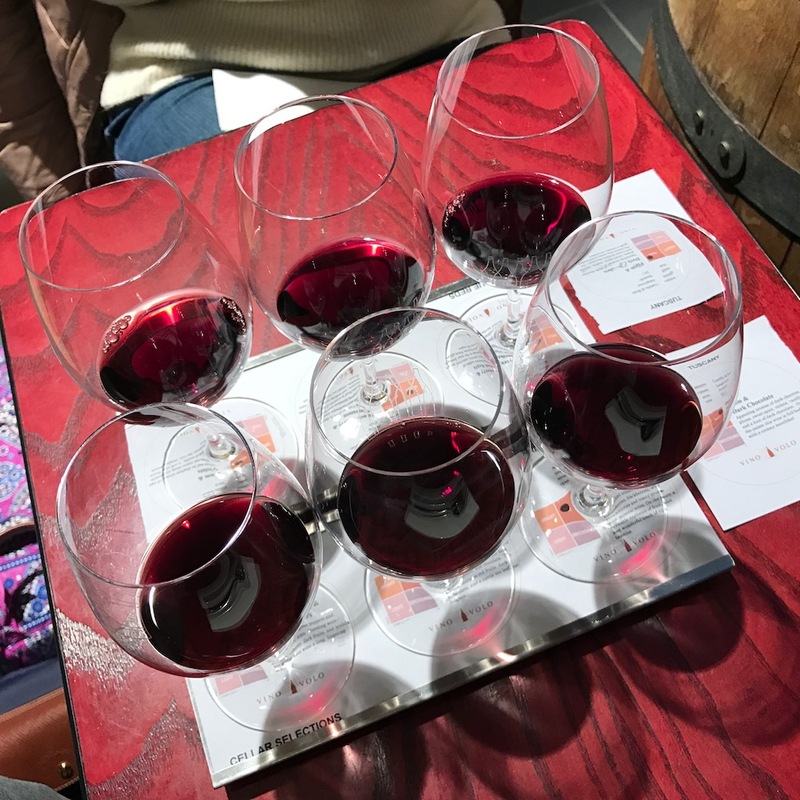 Both terminals are renovated, modern, clean, bright jumping off points for wherever your journey takes you, with E in particular being home to a lineup of dining options of which we think the popular Vino Volo wine bar is the best. All of the international airport lounges are grouped together about two-thirds of the way into the terminal, past the restaurants and around the corner to the right. The configuration here is bizarre, as an elevator will take down to the second level where there are no windows… so none of the lounges let in outside light. 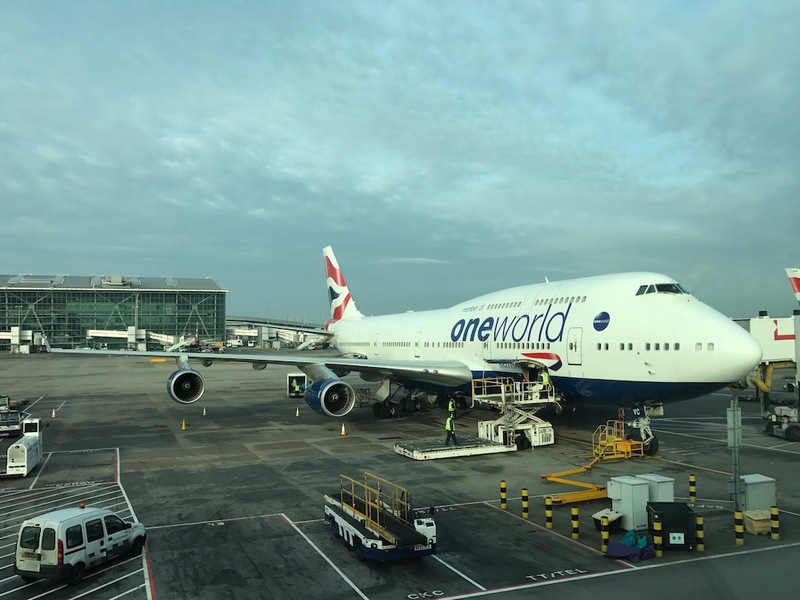 We first tried the British Airways lounge, which we were eligible for because my platinum status with American Airlines translates into OneWorld Sapphire status on partner airlines such as BA. Don't be fooled, though… a surly front desk attendant (who otherwise went out of her way to be as unhelpful as possible) promptly informed me that we were not welcome in the dining room because we didn't have a business or first class ticket. The dining room is literally surrounded by a cage. That said, the complimentary snack and wine choices in the rather crowded peasant area (my word, not theirs) were better than any I've had on a domestic flight in the United States. So... thanks? 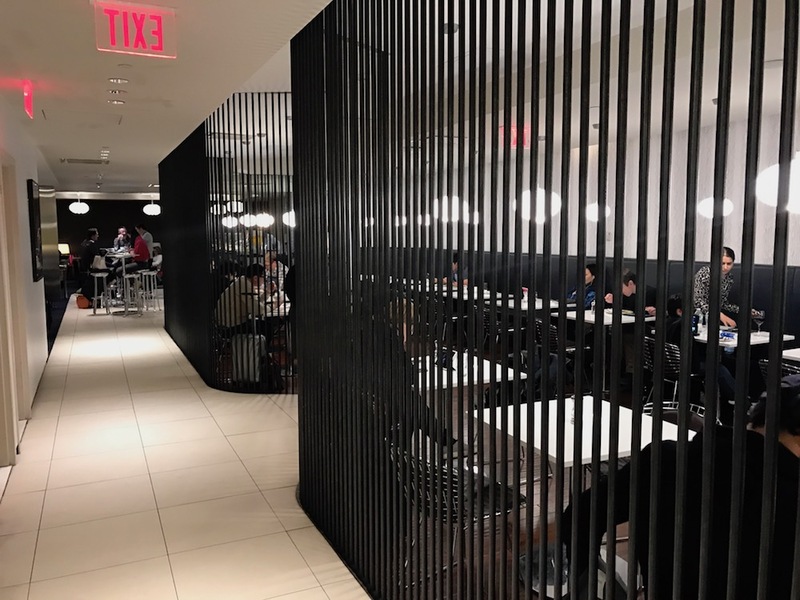 We also tried The Club lounge across the hall, which is accessible with Priority Pass membership issued by our Chase Sapphire Reserve and Citi Prestige credit cards. The Club is relatively new, and has big plans for expansion that I think could turn it into a superior option across the board. For the moment, though, I'd characterize it as a comfortable lounge with friendly people and a limited wine and food selection. BA seems to operate enough daily flights between Boston and London to qualify it as a shuttle service flying big planes. We arrived in time to see another flight depart… and another… before we got to ours. We hoped that this would have opened an opportunity to catch an earlier flight, but the gate agents and the aforementioned surly lounge attendant resolutely did as little as possible to make this happen for us. They claimed that all flights were full, though our observational and Internet-researched data say otherwise. The eventual boarding process was orderly. Our American Airlines Platinum status scored us early boarding privileges so that we took our seats immediately following first and business class. I cannot emphasize what a perk this is on these high-volume international flights. The zoo that follows in general boarding always makes me happy to be in my seat with my things stored away. The 747-400 aircraft is not new, but it has been nicely updated with a four-class configuration that includes a first, business, premium economy, and economy class product. I'd looked into the middle two, but concluded that it wasn't worth it as even premium economy would have easily quintupled the price of our ticket. We trudged back to row 30 in the 3-4-3 configuration (i.e. three seats next to the window on either side of each row, with 4 seats grouped together between the aisles in the middle). The fabric seats are comfortably padded relative to other trans-Atlantic planes we've flown. Their headrests are some of the best we've seen, adjustable such that one doesn't have any need for a neck pillow. The pitch (the distance between seats, i.e. legroom) is felt atrocious, though; economy class seats on this flight are not intended for anyone who values legroom. One should at all cost avoid storing anything under the seat in front of you, lest it be even worse. Simple math also gives you a 40% chance of a middle seat on these planes, making them less desirable than a similar long haul flight on, say, a Boeing 767 or an Airbus A330. Every flight crew is different. The more you fly, the more you realize that in the world of cabin crews, a single bad apple does not a rotten bunch make. Bottom line is that there was nothing wrong with the crew here... in fact, they were very efficient. But it's a thin line between efficiency and militancy, and from start to finish (lounge staff to gate agents to cabin crew), we couldn't help but feel like the entire BA crew we encountered on this journey really specialized in saying "no". Again, I cannot overemphasize the professionalism and the efficiency, but there was nothing warm and fuzzy about these folks, and not a one seemed to really enjoy their job. We can give this flight high marks on food and beverage. 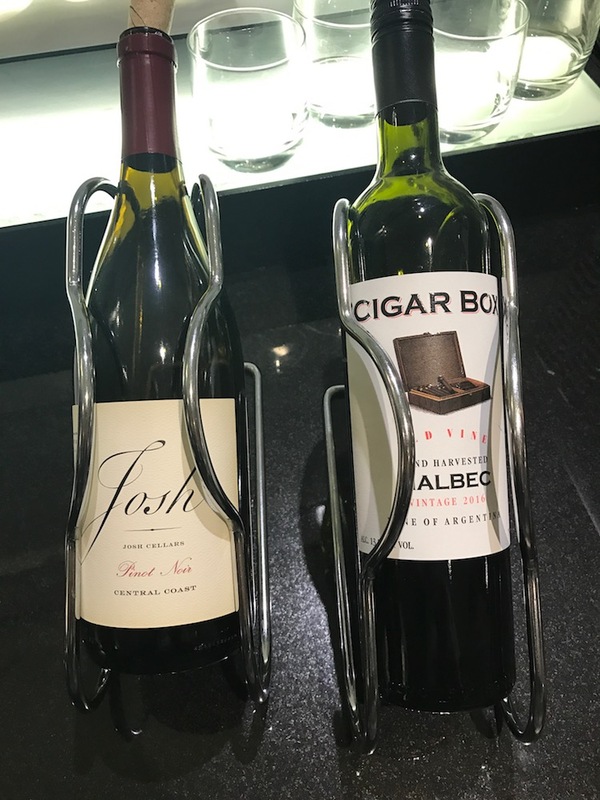 Wine is, of course, poured free of an up-charge on most international flights. The Chilean Cabernet Sauvignon served this evening was nothing special, but certainly on par with what's typical in economy class. Passengers chose between a curry chicken or pasta dish for dinner, and we found both to be tasty. The curry chicken, in particular, exceeded our expectations in this class (though was not a great pair with the Cab, as you might expect). 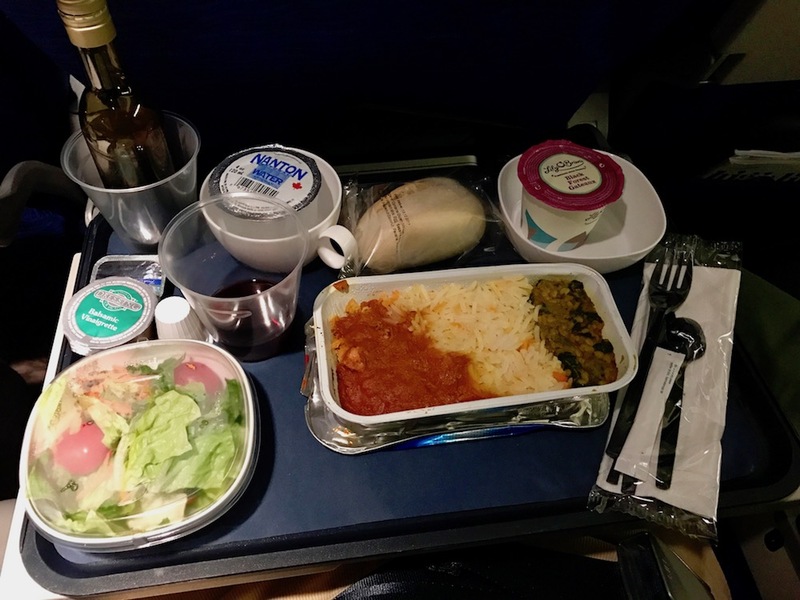 Airline food -- even internationally -- is not a gourmet meal, but we found the menu to be a high point of this experience. Full tea service was offered. I believe that BA is today's largest operator of the venerable Boeing 747 airplane. They operate a full range of Boeing and an increasing number of Airbus aircraft from their hubs at London's Heathrow and Gatwick airports. They are, in that way, the ultimate European connector, flying to many cities in the United States with the correlative ability to re-distribute those passengers throughout Europe. They also happen to be the same company as Spain's Iberia airline, each operating as their own brand under the International Airlines Group. The closely knit codesharing between the two makes, in effect, for a single airline with hubs in London and Madrid. Together they form one of the world's closest airline partnerships with American Airlines (whose European route network tends to not be strong as some other European competitors). As I said, BA operates an insanely frequent service between Boston and London, and then at New York JFK they are the only international carrier to operate their own terminal in the United States. Combine this with their very close American Airlines partnership, and you find that British Airways is a huge player in the trans-Atlantic marketplace. Indeed, British Airways and its partner airlines account for well over half of all trans-Atlantic flights that all current Wine:Thirty Flight bloggers have taken / will take in the last six or next six months. All of this is to say that British Airways looms large for passengers whose origin or destination involves the United Kingdom, Spain, or the United States (particularly the northeast). Writing this piece was challenging because there was a lot to love (soft seats, great headrests, tasty curry, tea service, sheer convenience in the volume of trans-Atlantic flights offered), and a lot to be irritated by here (cranky staff, cramped legroom, a lounge dramatically segregated by class). We've rarely had such mixed feelings about an airline experience. Our recommendation on this one is that you weigh the pros and cons and make a travel decision based on what's important to you. We'll be flying BA again in May, and will come back to you with our review of their Boeing 787 Dreamliner experience. Happy travels until then!